Got tickets for our anniversary concert? 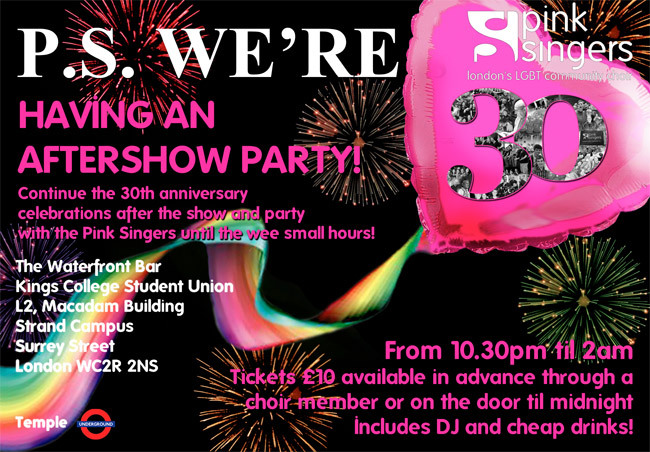 Why not continue the 30th Birthday celebrations with the performers at the Aftershow Party? Tickets are a snip at £10 which includes a drink and a rocking DJ til 2am! Tickets are available via a choir member or by contacting our Social Secretary Gary via joining@pinksingers.co.uk who will give you details on how to pay. Limited tickets available on the door. See you there! Next Next post: P.S. We're 30 – Buy tickets now!